iStock/Thinkstock(DALLAS) — A weather pattern stalled over Texas has produced the worst flash flooding since 1935 in Llano County in the central part of the state. The area got as much as 13.24 inches of rain in just the past two days. The Llano River rose from about 10 feet to nearly 40 feet in less than 24 hours. Also, Dallas broke the record for the wettest autumn on record — just halfway into the season. The city has received almost 2 feet of rain so far this fall. 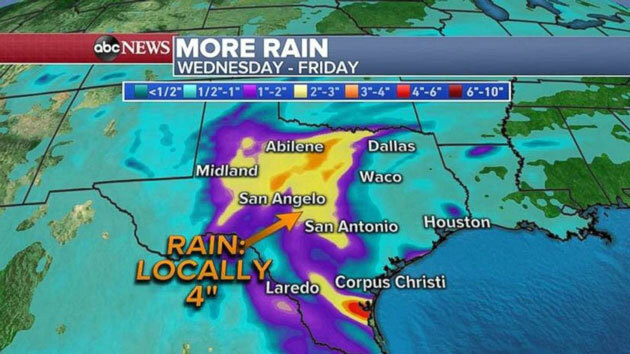 More rain is on the way for Texas on Wednesday and Thursday as flood watches and warnings remain in place for a large part of Texas. Some areas could see an additional 2 to 4 inches of rain in the next several days. The coldest air of this fall season so far will move into the Northeast on Wednesday night into Thursday morning. Widespread frost and freeze are expected along the I-95 corridor and 13 states from Missouri to Massachusetts are under alerts for one of the two. As the cold air moves in, a combination of chilly temperatures and gusty winds from 20 to 40 mph will bring the wind chills down into the 10s and 20s for some areas. Another, even colder, blast is forecast for this weekend into early next week.